I will attend this event and will notify the Cadillac V-Club if my plans change and I am unable to attend. I understand I am allowed to bring 1 guest. I will attend this event and will notify the Cadillac V-Club if my plans change and I am unable to attend. I understand I am allowed to bring my immediate family members (spouse and children) as guests. Join the San Antonio Chapter of the Cadillac V-Club for our annual holiday dinner event. This year the banquet will be held in San Antonio on Sunday, December 16 at 5:00 PM at The Alamo Cafe. The cost of your meal and and a non-alcoholic beverage will be compliments of the Cadillac the V-Club and Ken Batchelor Cadillac. All V-Club members with a single membership may bring 1 guest and if you have family membership, you may bring your immediate family members at no cost (spouse and children). V-Series owners who are prospective members may attend at no cost and may bring 1 guest for nominal guest fee. 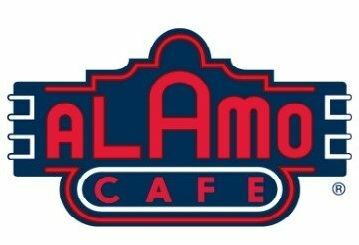 The Alamo Cafe has proudly served the greater San Antonio area for over 35 years. The original Alamo Cafe was opened in June of 1981 and located off of San Pedro Avenue. The second location was opened in August of 1985 off of IH-10 and is still operating today. In April of 1996 they moved their San Pedro location to Hwy 281 North which is the venue for our Cadillac V-Club holiday banquet. The Alamo Cafe is known for their famous homemade flour tortillas and chile con queso, and the very rare Queso Fountain. They serve everything from salads, quesadillas, enchiladas, fajitas, and chicken fried steak. Once again this year we are including the option for you to participate in our "White Elephant Gift Exchange", limit one gift per member/family. You are not required to participate but you will find the gift exchange to be entertaining and fun. Be sure to bring a gift valued at no more than $15 to exchange. If you are not familiar with a "white elephant gift exchange", it is a "Yankee Swap" Christmas party game. In its most basic form, the game is as follows: each participant brings one wrapped gift. The gifts are placed in a central location, and participants draw numbers to determine in what order they will take turns selecting them. The first person opens a wrapped gift and their turn ends. On subsequent turns, each person can open a new present or gets the choice to "steal" another person's unwrapped gift. When a person's gift is stolen, that person can either choose another wrapped gift to open or can steal from another player. The game is over when the last person goes and the first person goes again. Since the first player is the only one without the option of seeing any unwrapped gifts, this player is allowed to take one final turn after all gifts have been opened and swap with any "unfrozen" gift. In order to speed up the game, only 2 steals are allowed per gift. Gifts are typically inexpensive, humorous items or they can be an inexpensive "cool item" that generates a lot of "steals". 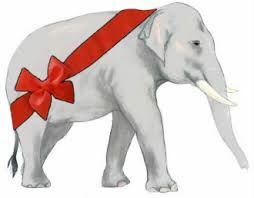 The term white elephant refers to a gift whose maintenance costs exceed its usefulness. To attend this event and also be eligible for a door prize, you must RSVP by registering via the CadillacVClub.com website. We have the Travis Room reserved for this private event and space is limited so please don't RSVP and be a "no show". If you RSVP and then your plans change, please be sure to cancel your registration so someone who is on the stand-by list can attend.